Karin Gündisch - the official web site. As one of her greatest fans I have designed a web page for my mother; it's only logical, isn't it? Born in 1948 in Cisnadie, Transylvania (Romania), my mother has studied German and Romanian in Cluj and Bucharest. In Bucharest she taught German; besides, she worked freelance as a reporter for the German press and broadcast, and she published narratives for children and contributed to German school books. Since November 1984 she lives in the south-west of Germany, at first in Freeburg, today in Bad Krozingen. She works as a writer. Do you want to check out an extract in German? 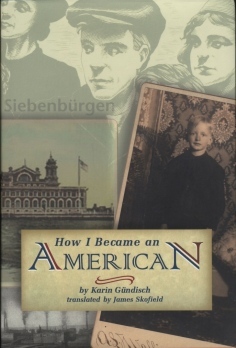 Unfortunately only one book is translated into English: Das Paradies liegt in Amerika. Please refer to the pages in German or French for more information about the other books! Regina had put away her embroidery, taken an old, broken-down boot that she had scoured clean, and placed it on a newspaper she had laid on the table. She was decorating the boot with a red and blue bow. "What on earth are you doing to that boot?" asked Mama, astonished. "It's an antique. I'm going to hang it on the wall. It's all the fashion." "What foolishness," Tata said and smiled. "You have to follow every fashion, Regina? Every folly!" Mama said, but she meant no harm. Regina hung the boot on the wall in our bedroom. Now we're fashionable and antique at the same time. James Skofield is a translator, writer, and librettist who has been the recipient of many grants and prizes. He lives in Walpole, New Hampshire. This book is also available in Germany. It exists in a slightly modified version in German, too.